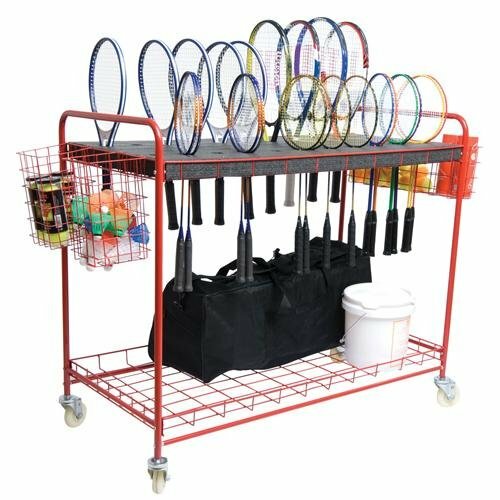 Keep your equipment organized with this Racquet Storage Cart that’s specially designed to hold tennis and badminton racquets and accessories in a safe and easy-to-store way. Will hold up to 22 tennis racquets or 44 badminton racquets or multiple combinations of both. Extra storage on the shelf below holds nets, equipment bags, etc. End baskets can contain balls and shuttlecocks. Constructed of a powder-coated red steel frame with 3″ diameter metal casters so everything travels easily. Measures 52″L x 25″W x 45″H. Everything’s in its place and ready to roll with this Racquet Storage Cart.